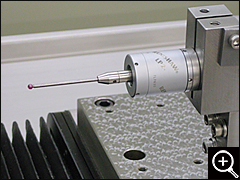 This accessory item allows for on-machine mechanical measurement of diameters and center thicknesses via a ruby tipped probe with a resolution of +/- 0.25μm. 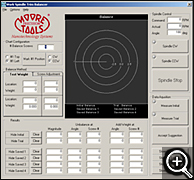 Actual measurements can be tied directly to production part programs for automatic adjustment to diameters and center thicknesses prior to removing the finished part from the spindle. Stainless Steel coolant shroud mounts directly to the spindle housing and saves operator cleanup time by containing slurry and chips throughout the machining process. Ideal for IR optic applications, the shroud has a removable top half for easy access to the workpiece. 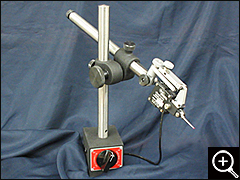 The electronic gage head is used to indicate parts or precision fixtures concentric to the spindle axis of rotation. 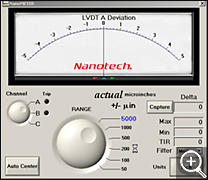 The gage head is compatible with Nanotech's digital on screen amplifier software — NanoMETER. This hand held controller provides the operator with the flexibility of having a portable remote pendant. Its long cord provides ample freedom to allow adjusting axes positions while being close to the workpiece. Includes docking station for storage when not in use. Our unique high stiffness tool holder with parallel reed design for mounting single point diamond cutting tools on the Z-axis carriage. This advanced flexure design maintains both tool rake angle and X position during height adjustments. 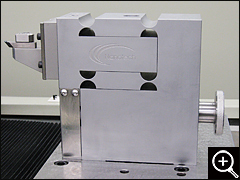 Includes both coarse and ultra-fine vertical adjustment mechanisms along with a tooling subplate for positioning the tool holder on Z-axis. Maximize your Z-table real estate with a tool holder that features 2 diamonds occupying no more table space than a single holder. Each diamond is rigidly held with independent course and fine height adjustment. 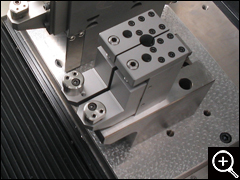 This tool holder facilitates high production setups, maximizing life of the finish tools and machine throughput. This system provides self maintenance of the machine’s air isolation system to ensure both proper float and table levelness as weight is added or removed from the either the Z-axis slide or main work spindle. Nanotech's On Screen Digital Gage Amplifier for use with LVDT probes and the electronic gage head. NanoMETER is included as part of our WECS accessory or can be purchased separately to operate on any previous Nanotech controller. The software replaces older analog 'boxes' with a more flexible and responsive digital equivalent. 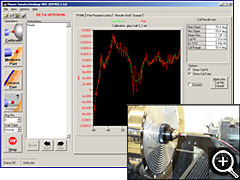 With free software upgrades for life via our FTP site, WECS is a valuable accessory upgrade for on machine form measurement & correction to less than 0.1µm. WECS has continuously evolved to improve both efficiency and capabilities. Recent additions include the ability to bypass a hole at center, a skip point function for fast surface measurements, and freeform data capturing.